It sounds like the Tarantino Star Trek Movie, should it ever actually get made, will be absolutely insane and covered in space guts, according to Karl Urban. The franchise is in an interesting place right now. Star Trek Beyond wasn't nearly as much of a hit as Paramount was hoping for and that has caused some issues with Star Trek 4, with both Chris Pine and Chris Hemsworth possibly not returning over financial negotiations. But Quentin Tarantino's Star Trek is still being developed and Urban says he actually knows a bit about it. Simon Pegg, Zachary Quinto and a few others have spoken publicly since the news of Quentin Tarantino's Star Trek movie broke. Though, none of them claim to really know much about it. However, Karl Urban recently appeared at Trekonderoga and, speaking on the subject, the actor who currently plays Bones in the franchise dished what he could dish without getting himself in trouble. Here's what he had to say about it. 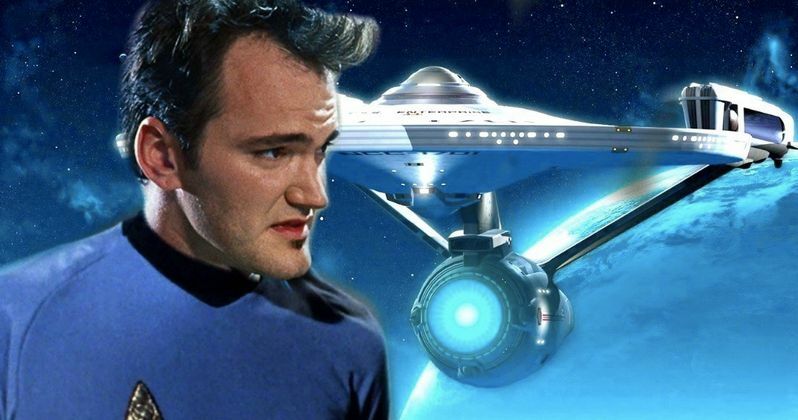 "Quentin Tarantino went in to J.J. [Abrams]'s offices and pitched him an idea for a Star Trek movie. I know a little bit about what that is and it's bananas... You shouldn't worry that it is going to be full of obscenity and stuff. He wants an R-rating to really make those beats of consequence land. If it's not PG, if someone gets sucked out into space, which we have all seen before, we might see them get disemboweled first... It allows some some breadth... gives him some leeway to do that. To me, that was always one of the things I loved about what DeForest Kelley did. He would actually capture the horror of space. That look in his eyes of sheer terror always struck me when I was a kid." We've heard previously that Tarantino would be aiming for an R-rating. That's not at all surprising, given his sensibilities, especially if he actually goes on to direct this thing. Right now, The Revenant screenwriter Mark L. Smith is penning the screenplay based on Tarantino's idea that was pitched to J.J. Abrams. The situation seems to be that if the filmmaker likes what comes back enough, he'll proceed to direct the movie. While virtually no details have been disclosed, it is expected he will utilize the current cast. Star Trek 4, which is to be directed by S.J. Clarkson, making her the first-ever female director within the franchise, was going to go in front of cameras first, then Paramount would have moved ahead with this project next. But given the situation with Pine and Hemsworth, the studio could end up shuffling things around a bit and make this a priority instead. Whenever it happens, if it actually happens, it sounds like this could be something the likes of which Trekkies have never seen before. We'll be sure to keep you up to date as more detail on the project are made available. This was previously reported by Trek Movie.